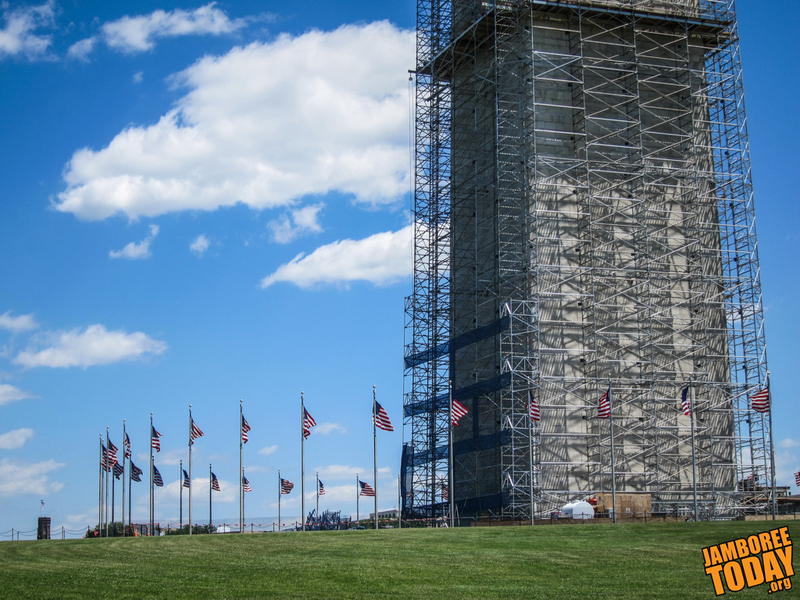 The Washington Monument, among the sights near the History of Scouting Trail, is under renovation in the nation's capital. Photo by Axel Anderson. WASHINGTON, D.C. — For Scouts and Venturers weary of traipsing up and down the Summit's hills and expanses, a friendlier post-jamboree alternative can be found in the nation's capital. It's an urban path, rich in Scouting history that, not coincidentally, is named the History of Scouting Trail. The trail debuted in Washington, D.C., over Memorial Day weekend when 3,111 Scouts — mostly from the National Capital Area Council — hiked it. During that weekend, Scouts and Venturers walked either of two lengths of trail — a 2.5-mile History Hike for Cubs, and another nearly six miles for Boy Scouts and Venturers that is the Colin H. Livingstone Hike. Scouts and Venturers were even spotted hiking the trail the few days preceding the jamboree kicked off. HOST is part hike, part treasure hunt, part advancement recognition — and all fun. Hikers are challenged to scour the city for symbols, figures, and physical features of man-made objects, and answer questions about them. Clues are found near the White House, Ellipse, Washington Monument, WWII Memorial, Boy Scout Commemorative Tribute Memorial, and even the exact place of origin of the Boy Scouts of America. Hmmm ... where could that be? Before beginning the trail, hikers need a $10 bill, camera, compass, downloaded questions, and a small plastic bag. The $10 bill will provide some clues. The man behind HOST is Peter "P-B" Bielak, who chairs the History and Archives Committee and HOST subcommittee for the National Capital Area Council. P-B prefers to be known by his initials because they're easy to remember (like "peanut butter"), and they allow him to quickly move to discussing Scouting history. For the past two years, P-B, with the effort of many others, researched, planned, tested, and proposed the trail to NCAC and BSA officials. One major supporter of the trail is former NCAC President Dan McCarthy, who is also director here at the Summit. Shortly before the jamboree, P-B met with McCarthy and presented him with a framed inaugural Livingstone Hike Medal and a photo of representatives of the D.C.-area's four oldest troops hiking the Taft Bridge. "It's a special presentation on behalf of the National Capital Area Council HOST Committee because he's promoting the trail to jamboree troops," said P-B before the ceremony. "When the trail concept began two years ago, he was president of the council, and he was supportive of the project." Said McCarthy earlier: "It was an excellent concept to have a trail dedicated to Scouting in the national capital," then adding to his comment today by saying, "What could be more perfect?" The HOST idea came to P-B at a district roundtable meeting, when a leader wondered when Scouting started in the United States. P-B said he asked himself why more people don't know about the origins of American Scouting, especially in Washington, D.C., a city rich in BSA history. "The Boy Scouts were such an integral part of the city at that time (1910)," says P-B, adding that Scouts have long helped stage presidential inaugurations. They even did so this year. P-B was also inspired by the "National Treasure" movies, where clues are sought — even in a hidden compartment in the president's desk — to solve mysteries. "I thought kids really liked that ... let 'em find clues, use a compass and their brains," ys P-B. "I thought that would be more fun than simply walking along a path." In Scouting's early years, all Eagle Scout awards were presented at the White House. In 1913, police lost control of the crowd during a woman's suffrage parade in D.C. Boy Scouts, who all carried staves at the time, stepped in to restore order as well as administer first aid. In its fledgling years, many major Scouting figures met in D.C. , including Robert Baden-Powell (world Scouting's founder), William Boyce (a newspaperman who imported Scouting to America), Juliette Gordon Low (who founded the Girl Scouts), Colin H. Livingstone (the BSA and NCAC's first president; he held both jobs at the same time), Dan Beard (national commissioner), Ernest Thompson Seton (chief Scout), and James West (the BSA's first Chief Scout Executive). Besides his motivation to add fun and education to Scouting, P-B also had a lofty goal: To help support Scouting financially. Proceeds from the sales of HOST medals and patches will go to enable the NCAC to provide good Scouting opportunities for all local youth. P-B will eagerly tell anyone in earshot that Washington, D.C.'s oldest Scout troop — 100 — was begun in 1918. Maryland's is Troop 8 (1919), Virginia's, 104 (1916), and in the NCAC, 52 (1913). Scouts and Scouters of all four troops led HOST's Memorial Day weekend hike. HOST is the only BSA historic trail that can be hiked 365 days a year and that the effort can be accomplished in a day, P-B says. This means trail maps can be downloaded, the trail hiked, questions answered, form stamped, and medals and patches purchased. Scouts and Scouters who satisfactorily complete HOST's requirements are eligible to buy a medal and patch. Both trails end at a pair of trail project "partners": the International Spy Museum, and Madame Tussaud's Wax Museum. Plans are for the trail to evolve into two other hikes — each progressively longer and more challenging. The first one that opened on Memorial Day weekend was the aforementioned Livingstone hike, which begins at the Taft Memorial Bridge. An hour later, the shorter History Hike began. Details on HOST can be found at www.historyofscoutingtrail.org.